Major rollouts: Three Cars-themed rides at California Adventure, plus Disneyland facelifts. Hot ticket: The $125 one-day Park Hopper pass gets you into Disneyland and next-door California Adventure with Cars Land. Check online for ticket deals. Before you go: Stroll Downtown Disney (an open-air mall next to the two parks) for La Brea Bakery’s croissants and cappuccinos. Spend less time waiting: A Fastpass, available at kiosks by the most popular rides, saves you a space in line. Love for L.A.: California Adventure’s new Buena Vista Street evokes 1920s Angeleno icons like Red Car Trolleys. Luxe lunch: California Adventure’s Carthay Circle Theatre restaurant ($$$) is modeled after the movie palace where Snow White premiered. More info: and 714/781-3463 (dining reservations for both parks). Disney’s big news: The 12-acre, gazillion-dollar Cars Land is the biggest addition to the Disneyland Resort in decades, designed to punch California Adventure into overdrive. 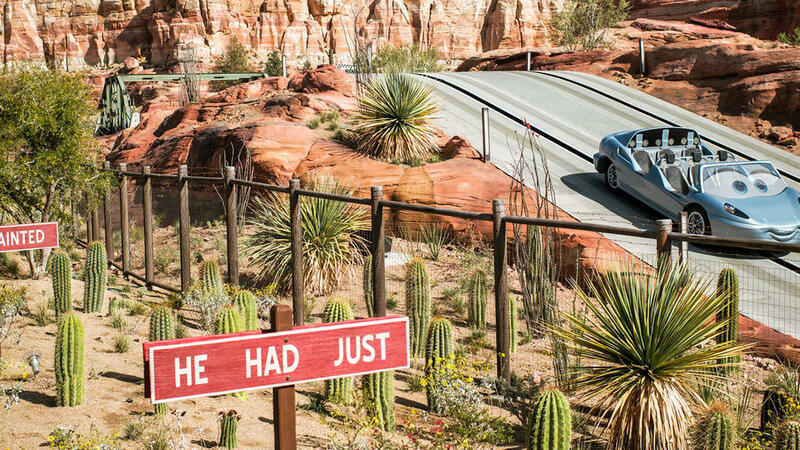 In the Route 66 roadtrip world of Cars, you can careen across Southwestern cliffs and canyons on Radiator Springs Racers (shown above), float on Luigi’s Flying Tires, and square-dance on a tractor in Mater’s Junkyard Jamboree. Yo, Yoda! Disneyland amped up its already cool Tomorrowland Star Tours attraction in summer 2011, adding 3-D and multiplying scenarios so you can evade Imperial Stormtroopers on planet Kashyyyk with Princess Leia, or follow Yoda to undersea world Naboo, or … well, calculating possible permutations is just the thing to occupy Star Wars nerds as they wait in line. But, trust us, non-nerds will dig it too. Power dinner: A 2 1/2-year makeover has given the Disneyland Hotel an early-’60s aura, especially at its urbane Steakhouse 55 ($$$$), where the Mad Men vibe is so strong, you fantasize about the two worlds colliding: Don Draper cutting a deal with Mickey Mouse, Donald Duck squawking at Joan. No? You’ll still like the bone-in rib-eye. It’s tiki time: If you’ve always loved Disneyland’s Enchanted Tiki Room and its warbling birds and wholesome pineapple juice, as an adult you’ll appreciate that Disney has added booze to the mix. Say aloha to Trader Sam’s bar, poolside at the Disneyland Hotel. No singing macaws, but tons of tiki ambience and potent concoctions. Save the best for last: California Adventure’s nightly World of Color is 26 minutes of psychedelic bliss, with projected images of Disney’s animated stars—like Woody, Ariel, Aladdin, and Jasmine—cavorting in the night sky above Paradise Lagoon amid dancing fountains and jets of flame. Use your Fastpass for the best viewing spots. Not into spectacle? As crowds gather here, it’s prime time to hit thrill rides like the Twilight Zone Tower of Terror. Make it a weekend: Disney’s three on-site hotels give you easiest access to both parks—at a price. The Disneyland Hotel (from $400) feels the newest after a top-to-bottom refurb, and even the pool area has gone midcentury modern, with Monorail-inspired waterslides. Want nice but less pricey? The Mediterranean-style Anabella Hotel (from $99; ) is a 10-minute walk to California Adventure. У нашей организации нужный сайт , он описывает в статьях про imagmagnetsns.ua.